During the 17th Century, Holland was truly experiencing its golden age. Money was pouring in from its colonies, although most notably from its highly profitable spice trade in the East Indies. The Nouveau-riche had finally arrived and were ready to spend, spend, spend. Although strange to us with our modern obsession for advancing technology, the wealthy elite of the 17th century expressed their status with the ownership of rare and ever more beautiful bulbs. This was finally expressed in the speculative frenzy known as Tulip mania. The tulip mania period of 1636-1637 was a crazed period in Dutch history when the contract prices for bulbs - in particular the newly-introduced Tulip - reached extraordinarily high levels only to suddenly collapse causing massive financial distress across the country. At the peak of tulip mania in February 1637, inflated tulip contracts were selling for more than 20 times the average annual income of a skilled craftsman. This phenomenon is generally considered to be the first recorded speculative bubble and nowadays the term "tulip mania" is often used metaphorically to refer to any large economic bubble. Two of the greatest names of the Tulip mania period were the 'Viceroy', and 'Semper augustus' and these were very popular with the old Dutch Masters. 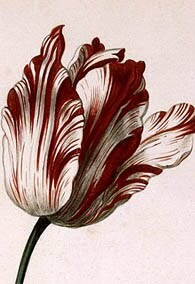 The Semper Augustus was a red tulip patterned with intricate white striations while the similar Viceroy was red mixed with yellow striations. 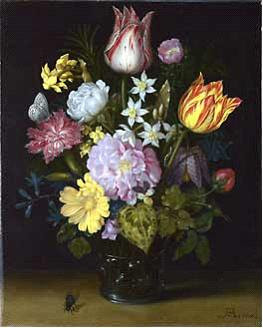 Perhaps the most famous of these was the 1614 masterpiece 'Flowers in a Glass Vase' by Ambrosius Bosschaert the Elder as these featured both of these sought after bulbs. The original (see above) is currently in the National Gallery, London. At its peak, the Viceroy bulb cost between 3000 and 4200 florins depending on the size of the bulb. To put this into context, a contemporary skilled craftsman would have earned about 150 florins a year. In 1633, one Semper Augustus bulb was said to have sold for 5,500 guilders, and in 1637, just before the crash, a price of 10,000 guilders was asked. In those days, such an exorbitant amount of money would have purchased a grand house on the most fashionable canal in Amsterdam.